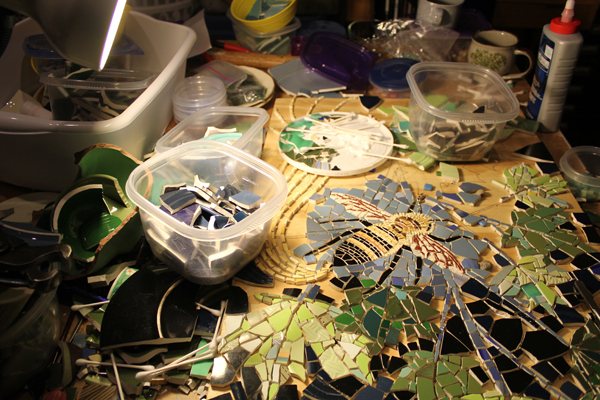 Making mosaics is a complicated process with moments of magic. Fitting the tiles in place is like putting together a puzzle, except that I create the puzzle pieces as I go along. Although one can buy tiles for mosaic-making or use all manner of things like paper, macaroni, seeds or rocks, I chip my own tiles from secondhand ceramic plates and other dishes that I find in a range of colors and patterns at thrift stores. I have accumulated many dishes over the years, with occasional gifts from friends and acquaintances who sometimes leave their broken dishes on my front porch. Because I work with dishes that need to be continually broken and shaped, my tile nipper is always close at hand. But before I cut and shape the tiles with my nipper, I use it to break the dishes first with a good solid whack, dividing each into smaller pieces that I can more easily work with. I look for broken pieces that are the right shape and size to fill spaces, and I also cut and clip them to fit more exactly. By the end of a project my work table and floor are covered with tiny discarded bits from this process. Before the tiling begins, I develop an idea and then make a plan. I play around with images and ideas by drawing in my sketchbook, often little pictures that would only make sense to me, and then I change and expand on these. When I have played around enough and have settled on a concept, I make larger drawings of the key elements at scale, sometimes using reference pictures from my own photos or ones I find in books or on the internet. The last step in the design process is to map the images and key color choices onto a plywood work surface, also called a backer board, with simple outlined shapes in black marker. I enjoy the creative process more if I leave some design decisions and color choices to resolve in the making process. I have twenty dishpans in my studio filled with dishes in various stages of brokenness, sorted by color, accompanied by smaller containers of smaller pieces that are sorted too, to choose from. I try to create mosaics where the imagery can be read through distinct color-shape areas, and yet I bring color-variation into these areas too, for added interest. Sometimes I sneak other objects into my mosaics to surprise the viewer, among them fossils, rocks, shells, or specialty tiles. 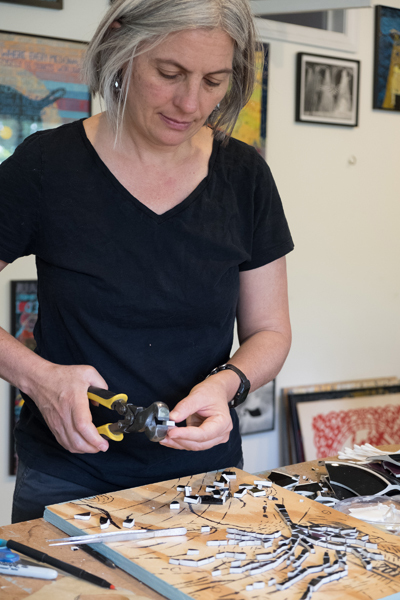 My mosaics have become more sophisticated over the years, and yet I continue to learn more and more through the process of making them. The final stage is grouting. After I glue all of the tiles into place and the glue has dried, I vacuum the surface to sweep up bits of dust and debris before I begin to apply the grout, a cement-based material used to fill the cracks between the pieces. I use grey or tan grout which contrasts well with a range of colors, but colored pigments are available to mix into the grout, too. It is hard to judge what a mosaic will look like once grouted, so I usually go into the grouting process with some trepidation – how will it turn out? That said, grouting always brings a sense of unity to the work that is often pleasantly surprising. 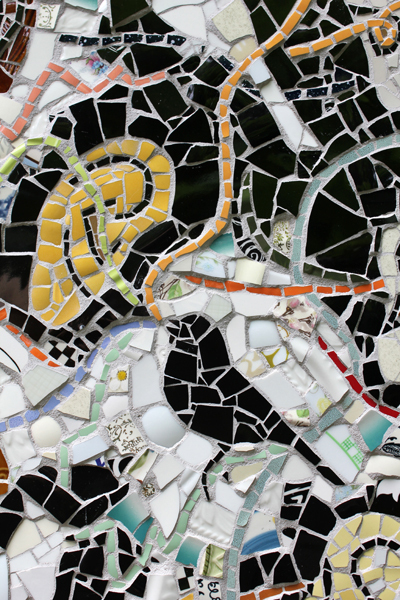 The grout is like magic that helps transform a pile of broken dishes into a pleasing cohesion. The grout must be removed from the face-surface of the tiles before it dries. Cleaning the tiles is a tactile process because my use of dishes creates an uneven surface, different from mosaics made from uniform commercial tiles. I use my hands and a rubber spatula to remove the bulk of the excess grout from the tiles before I begin wiping away the grout with a damp sponge and rags. The final stages of cleaning remind me of dental work. In fact, I use old dental tools that a friend gave to me to clean the smallest and shallowest pieces that I can’t wipe by hand. Finally, I buff the tiles with Windex, and then the piece is complete. Click here for more photos of With Nature Sing. 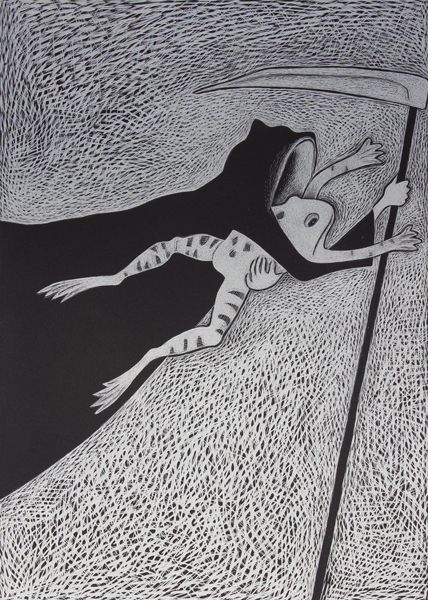 “The Toll” is a ballpoint pen drawing, 22″ x 30″, that I made for the exhibit “Currently Nontraditional” at the Lawrence Arts Center through Oct. 22, 2016. 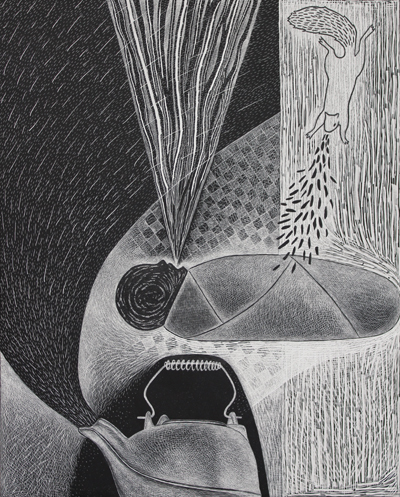 The exhibit includes works on paper by 12 artists, each responding to some aspect of what 2016 has meant to them. 2016 has been a year of violence, mass shootings (including one in Hesston, Kansas, near my hometown), terrorism and war. To depict the pain of 2016, I drew many individual paper cranes as the overall pattern in my drawing. Most cranes are marked, wounded or shot, crumpling and falling to the ground. A few shots miss and a few cranes survive. The paper crane became a symbol for international peace after Sadako Sasaki, a Japanese girl who was a victim of radiation sickness from the atomic bomb dropped on Hiroshima, attempted to fold a thousand paper cranes before she died. 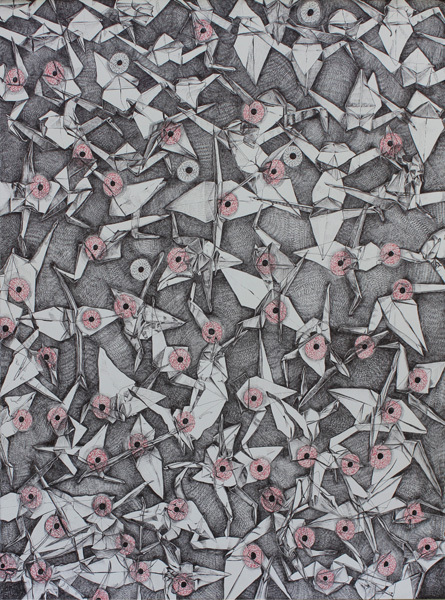 My drawing is about the fragility of peace and the toll of violence, with an awareness that every person killed in a mass attack, is an individual who was loved and will be missed. 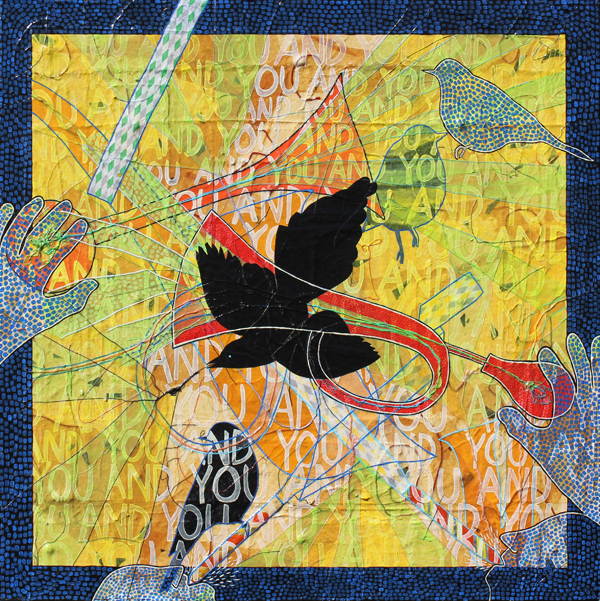 Birdsongs is a new mosaic from the series, Sound the Climate Alarm. 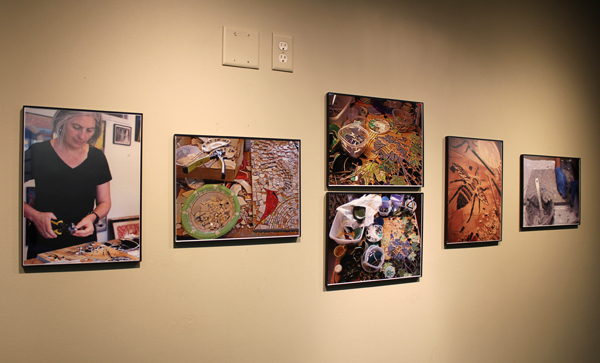 Two mixed-media collages of mine, Sound the Climate Alarm (at left) and an older piece called Laughing and Crying (below at right) are currently on display in a group exhibit exploring issues related to the environment. The exhibit, titled Terra Verde, features the ceramic work of Eleanor Heimbaugh, and can be viewed at NOTO ArtsPlace in Topeka, during Topeka’s First Friday events on May 1, 2015. The climax of the march came in the early afternoon. All along the route, crowds had been quieted for a moment of silence. On Avenue of the Americas at 57th Street, there was an eerie silence as marchers raised their arms and looked down. Then at exactly 1 p.m., a whistle pierced the silence, setting off a minute-long cacophony intended as a collective alarm on climate change. There were the beats of the drums and the blaring of horns, but mostly it was whoops and cries of the marchers. At South Park in Lawrence, Kansas, after a simultaneous moment of silence with those in New York, a voluminous sound rang out too. When I first envisioned a collage about that noisy moment, I had wanted the look of the sound to be as big as possible, a visual cacophony. So in the collage I made images of saxophones layered upon bike horns, on top of other horns, and then party blowers. In addition, the repeated words “you and you and you and you” add to the visual confusion and also invite (or implicate) everyone into the meaning of the piece. And yet even with all of that going on, the visual impact is still subtle. The look of the sound is atmospheric and thinly skeletal, a subtlety that happened in the creative process that I decided to keep. And then a bird flew into the piece and I painted it black. Compared to the climate alarm that I heard, my visual expression is low-impact, and yet I am pleased with it. 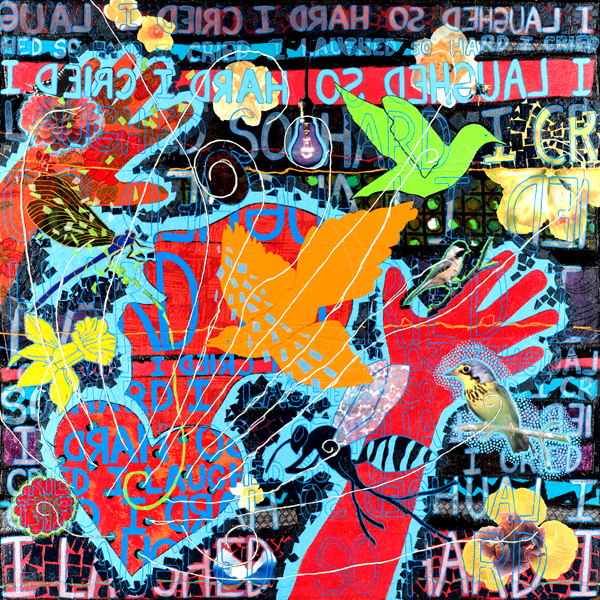 For me its meaning is enhanced hanging in the exhibit beside Laughing and Crying, another colorful collage that I made seven years ago with an image of a person laughing surrounded by insects, birds, and blossoms. The piece depicts strong emotions and expresses how I feel about the environment today. It is the words in the collage, “I laughed so hard I cried” and “I cried so hard I laughed,” that express the emotional contradictions that I feel each day in our rapidly warming world. For example, a gorgeous spring day in the face of climate change can feel like beauty and terror combined: birds, blossoms, and butterflies along with heat, drought, and tornadoes. Even so, Laughing and Crying is primarily a visually joyous piece with an orange bird smack in the middle surrounded by lots of activity, full of hope. 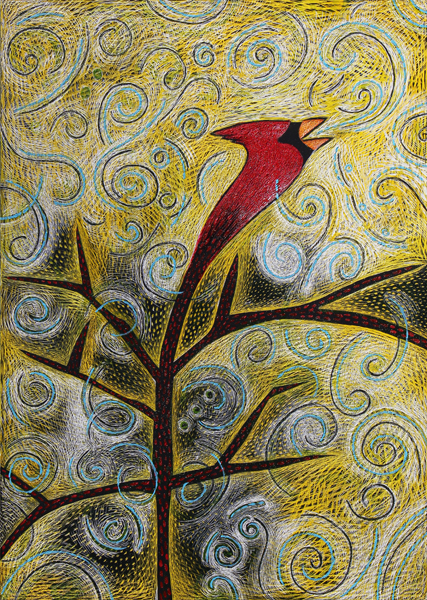 Sound the Climate Alarm, by contrast, includes the same bird but this time it is painted black and appears on a background full of sunny-yellow energetic emptiness, a warning color scheme. When I see these two pieces together in the context of an exhibit about environmental concerns the alarm in the one piece is for me reinforced by the joy in the other and again I think of spring in a climate-changed world, a feeling of wonderment that is also full of discontent. How many more beautiful springs will there be before all we have left are summers? In a climate-changed world, what will happen to my son? Animals–mostly birds but other critters too–have taken up residence in my art for many years. I didn’t exactly invite them. Like squirrels drawn to my bird feeder, I don’t recall intending to focus on critters but they have been drawn into my art. 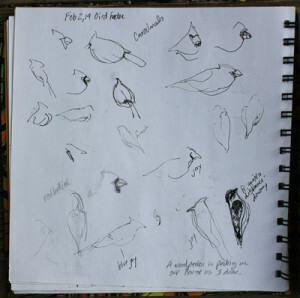 And yet I did put up the feeder, and I did create these images, and so of course I invited them. 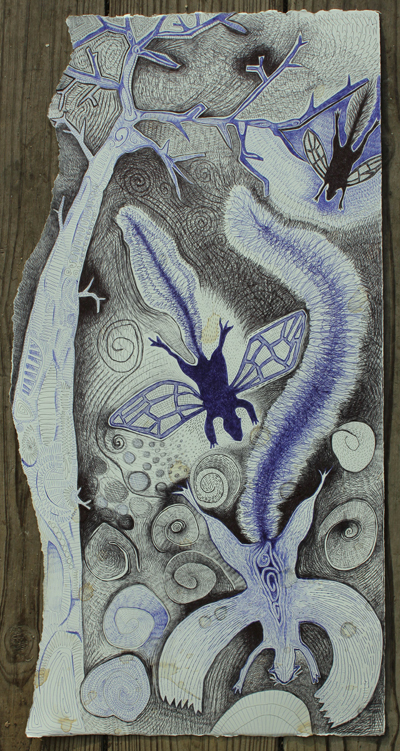 Birds, frogs, cats, cicadas, squirrels and other critters are with us in life and so too in my art. In Steamed (2011), a squirrel chatters noisily like so many colicky babies (or whistling teakettles), clamoring for attention. In Stir (2010), birds with human legs spring forth to dance or fly. 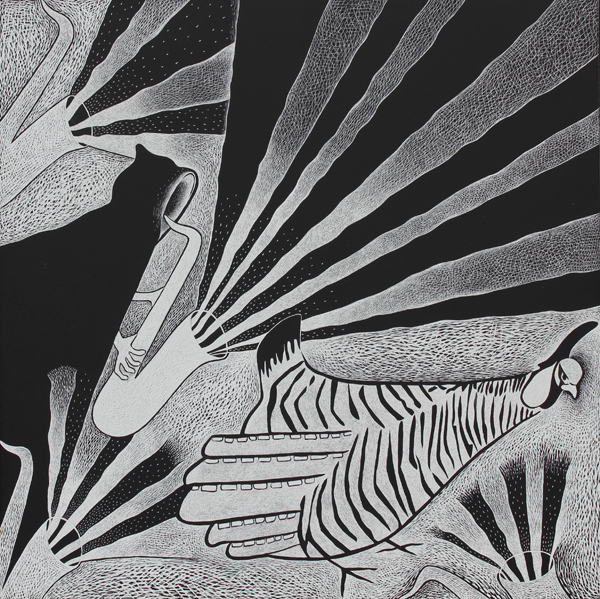 And in Composition With Goose (2009), a calm cat and a very wound-up goose hold forth and argue. But more recently, in the past half-year or so, I’ve changed a little. I am thinking more intentionally about critters, my relationship to them, and the impact of human activity and climate change on them. I think of my pictures as a stage and the animals and people in them as characters playing a part. But instead of using birds or squirrels to tell stories that are really about people, the critters I’m drawing now are playing the part of themselves and are part of the story. In Frog, My Friend, for example, a frog, a casualty of the South Lawrence Trafficway, is carried off by “Death.” Or maybe the frog is our pet frog that died because we just couldn’t take care of him right. Either way, the frog in this story is a frog. In Run!, a Prairie Chicken plays its own part, too, on the run from Death due to habitat destruction and Kansas politics. 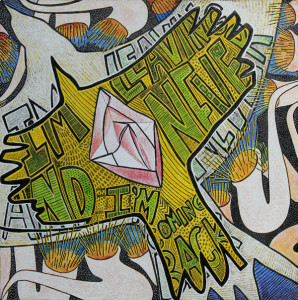 In Passenger Pigeon: Abstract Memory, a cloud of extinct Passenger Pigeons becomes abstract and fades from memory. 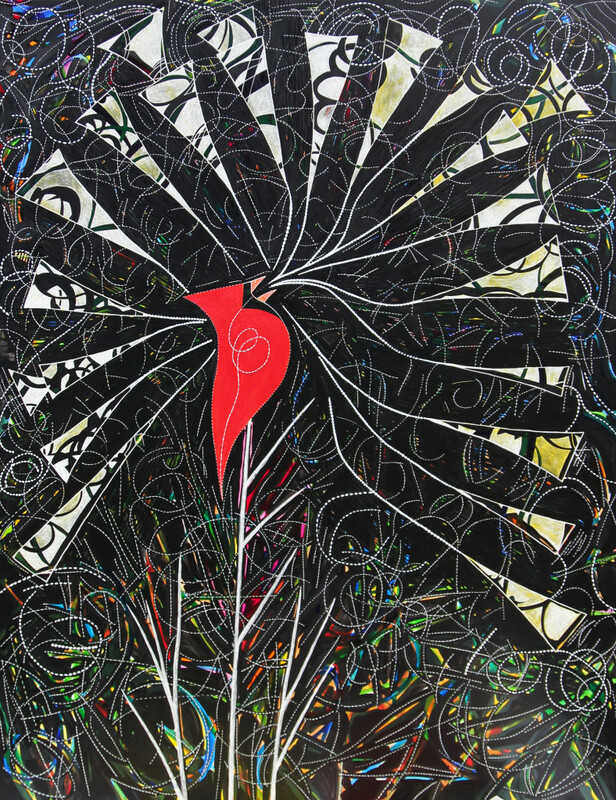 In Robin, Been and Gone, a robin is depicted along with several robin-silhouettes, symbolizing presence and absence, a reminder of what pesticides can do to birds. These are of course my images for my very human purposes, too. 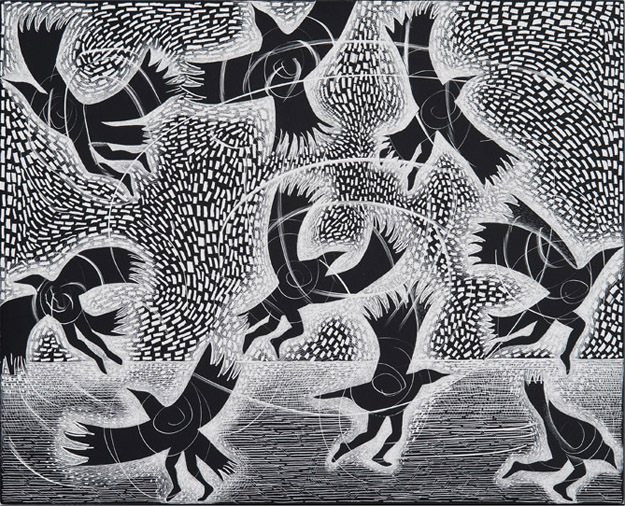 But I hope that by thinking more about the role of animals in my work, I can remind viewers that we have a relationship with animals, and that this relationship is fragile. larger body of work. I was moved to think more about animals in the broadest sense of the word after reading Elizabeth Kolbert’s The Sixth Extinction. Her book includes story after story of scientists worldwide documenting the process of animals becoming extinct because of human-caused global warming. Animals are leaving us now, and they are never coming back. In my new work I am guided too by collaborating with my composer-friend Lynn Gumert, of Hightstown, NJ. Lynn and I have talked on the phone and we have exchanged emails, images, and sound. We are working together on loosely-related themes in our work, themes that include the impact of climate change on weather, animals, and us. Lynn is working on a series of related short saxophone quartet pieces, and eventually our work will be presented together. Her first notes to me depicted a river. Building on her compositions I am also playing with images of saxophones and literally drawing their “sound,” as in River Song. 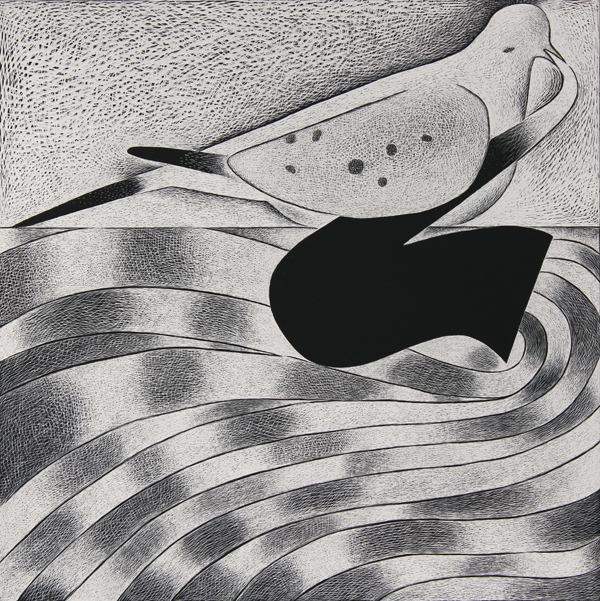 In this piece, a Mourning Dove plays a saxophone-river. This, too, is another experiment in visual storytelling. 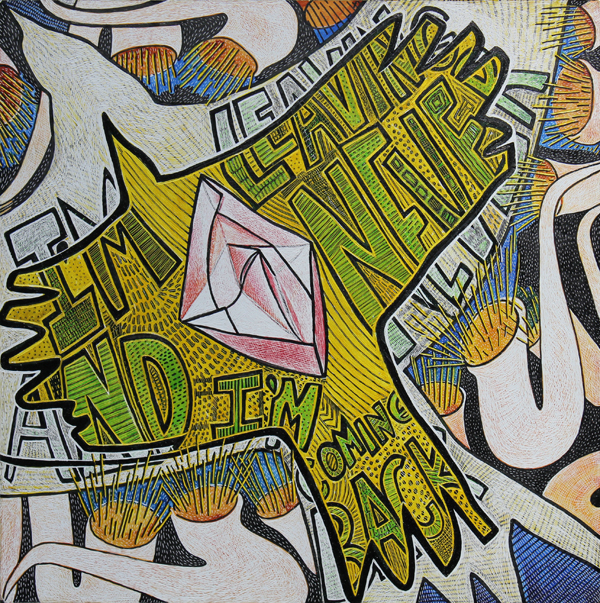 Please join Karen Matheis and me for our two-person show at the Phoenix Underground, opening Final Friday, June 27, 2014, 5 – 9 pm, from June 27 – July 23 at the Phoenix Underground (825 Massachusetts, Lawrence, KS). I’ll show these works and others too, and almost all of them include animals. Note: The flying squirrel-doodle to the left (12″ x 20″) is the subject of this blog and is the doodle that I refer to throughout. 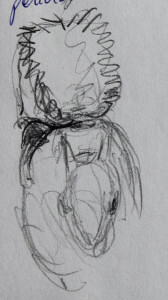 Other images are from my sketchbooks. What’s in a doodle? Curly do-dads, texture, funny wings, big long tails, emotion, practice, improvisation, new ideas, new media, spilled tea. Even the sound of the word doodle suggests spontaneity and flow. Doodling is the quintessential imaginative drawing, and imaginative drawing is the theme of a new drawing class I’m planning for adult learners this Spring at the Lawrence Arts Center. This class is the reason I’m thinking about doodling at all and about the place of doodling in my own creative process. I keep sketchbooks but often begin my explorations with writing. So when writing gives way to sketching, doodling, and drawing, a ballpoint pen is in my hand and is often what I use. 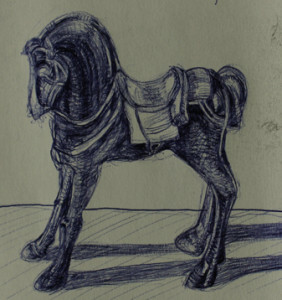 I learned recently that ballpoint pens are the medium of choice for entire on-line communities of artists. And the January 2014 cover of ARTnews shows the work of ballpoint pen artist Toyin Odutola and inside the magazine is the work of other ballpoint pen artists, too. Inspired by these, I decided to explore this medium in a large-scale doodle-drawing to gain a better understanding of it not just for sketching but for “finished” work as well. So already through the pen, art and life are connected in a doodle. 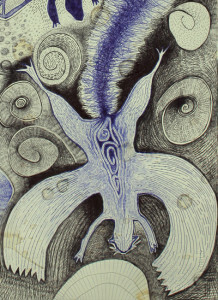 Or maybe life itself is a doodle because in a doodle, everything feels connected. 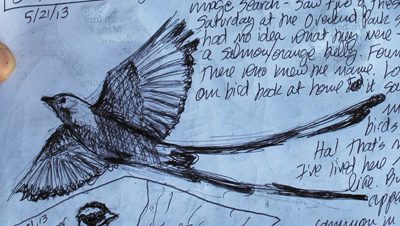 For example, the first time I saw a Scissor-tailed Flycatcher was at the soccer fields in Overland Park, Kansas, and that little piece of history is in this doodle. It isn’t in it literally, but that experience led to something that led to something that is in it. When we returned from Overland Park that day, I looked for this beautiful grey-blue bird with the extravagant tail in my Kansas bird book and found it, “one of the most well-known birds in Kansas.” Ha! I was surprised and wondered what else I have never heard of. And perhaps more interestingly, what might be all around me that I have never seen? I began reading Bert Dodson’s book, Keys to Drawing with Imagination, and drank in his encouragement to doodle, to stretch your doodles in new directions, to noodle the doodles, and to mix them up. I joked about getting a bird-proof squirrel-feeder. Or how about a Squird feeder! Of course there are Flying Squirrels. But what if flying squirrels had actual wings? What if they had cicada wings? Doodling odd flying squirrels made me think of those strange prehistoric creatures that surely should not be able to fly but surely did. Amidst my listening to jazz and “All Things Considered” on the radio as I doodled, I heard Terry Gross on “Fresh Air” interview author Elizabeth Kolbert. Kolbert talked about her new book, The Sixth Extinction: An Unnatural History. In it she explores the fact that species are dying off so quickly due to the impact of humans, that it is a time of mass extinction, and is considered the sixth mass extinction on earth. My flying squirrels will never exist but imagining that they could provided a moment of levity as I listened to Kolbert’s dark accounting of the extinctions of species now taking place as I doodled. I wrestled with the ugliness of it all in the vigorous marks I made in the tails of my flying squirrels. And that’s not all the bad news I was hearing as I worked. At this same time the Kansas House of Representatives passed a bill to preserve “religious rights,” a bill really intended to take away the rights of gay and lesbian people should they ever be allowed marriage equality in Kansas. I explored the absurdity of it all as I doodled. I went to KU’s Natural History Museum on the day I took my computer in for repairs. Little squirrels had been nesting in there, slowing it down and giving me that interminable spinning pie wheel. It had been a long while since I’d been to the museum, and I wanted to scope it out as a possible destination for my drawing students. There were old bones and taxidermied creatures. I came across a Scissor-tailed Flycatcher and a flying squirrel (a dead but real one) and made a quick sketch of the squirrel. And I decided that I would like to make some art about animals that are gone. And then the doodle was done. I liked some of the things that were going on in it, especially the bottom-most squirrel. 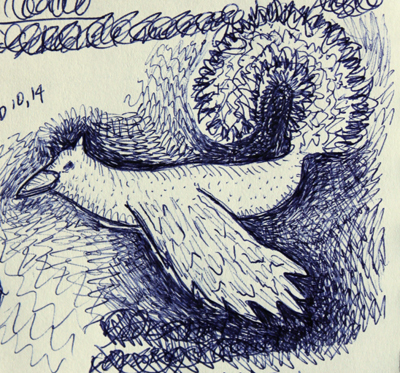 The shape and pattern of it had a visual integrity that the more cartoon-like squirrels seemed to lack. I liked working with a Bic ballpoint but wasn’t fully satisfied with it either. I couldn’t get the darks dark enough. I figured out that the basic Bic crystal has a twin, the Bic crystal pens found in the pack of 12 colors, and with these I could eke out a slightly better black and darker blue. I wondered how this image would look in scratchboard, a medium I’ve used a lot. 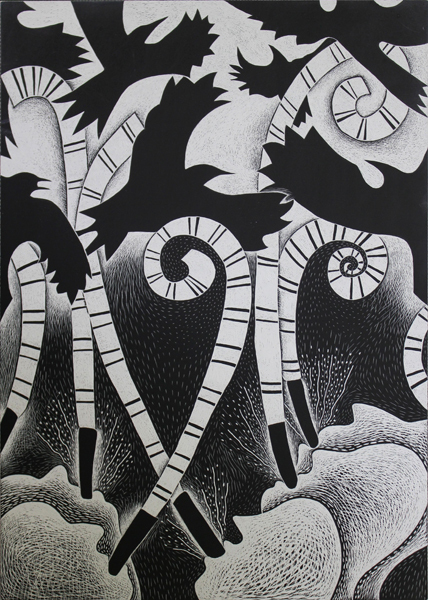 But in scratchboard, how could I keep the sense of spontaneity that I liked here, when I find the application of lines in Scratchboard to be more cumbersome? The doodle helped me ask questions and forge other kinds of professional connections, too. I wanted a better-than-Bic pen for a blacker black and went on-line to find out how I could un-clog my old Rapidograph technical pens. Happily I found an on-line community to help me. When I posted my doodle on my Facebook page, a friend shared about an interesting on-line doodling community. And the doodle may have suggested a path forward on an illustration job that I’m working on. It even helped me process the beginnings of a collaboration with a composer-friend in New Jersey. We hope to explore a music/visual art collaboration and our point of departure will be nature, climate change, and extinction. For her part she will begin composing about a river. I will start with birds or frogs. Then we’ll trade our work and see how the other person’s art inspires a second round and hopefully many more. The Percolator is between 9th and 10th Streets and half a block east of New Hampshire St. It is in the alley behind the Lawrence Arts Center, Lawrence, KS. Thanks to all who helped with the Free State Brewery mosaic! Nearly Spring is complete! 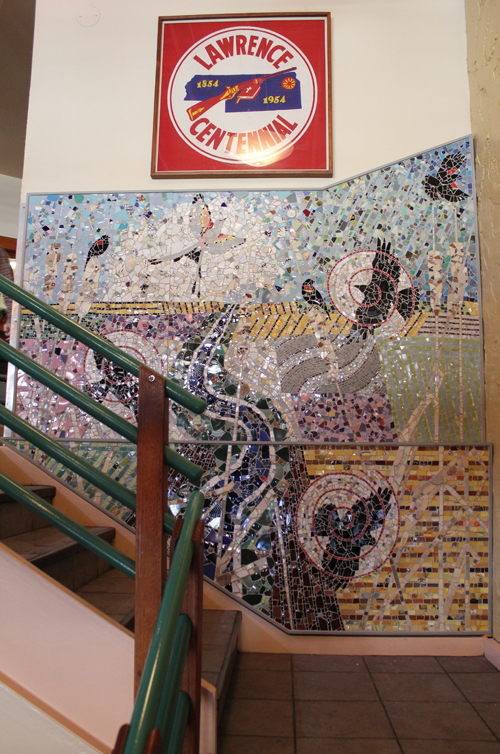 It is a seven-foot mosaic mural installed on New Year’s Day at the Free State Brewery in downtown Lawrence, Kansas. The mosaic was a wonderful project and I am writing to give thanks to all of the people who were in one way or another a part of its creation. Foremost I want to thank Chuck Magerl, proprietor of the Free State Brewery. He was wonderfully supportive throughout this project. 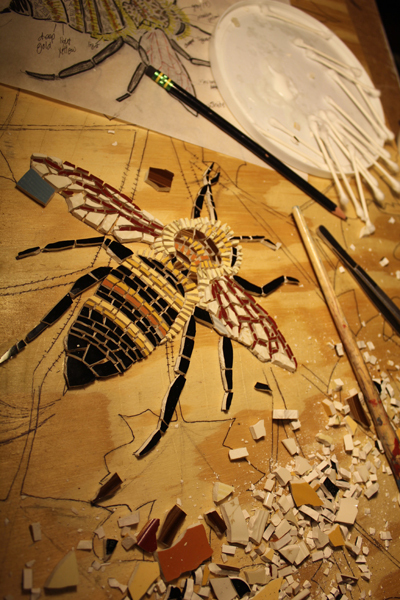 He invited me to discuss the possibility of creating a mosaic for a particular spot in the brewery. Our first meeting was in December of 2012 and, while I was hesitant to take on a large-scale mural and had never even used mortar before, I left the meeting excited about the possibility and hoped to get the job. 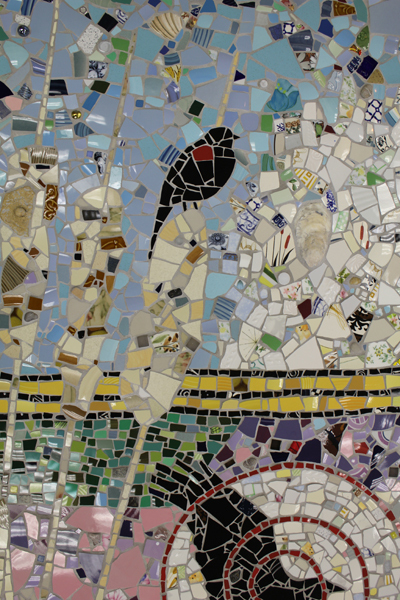 The ideas for the mosaic grew out of several conversations with Chuck that meandered through broad topics, among them birds, water, and the Lawrence area’s landscape. 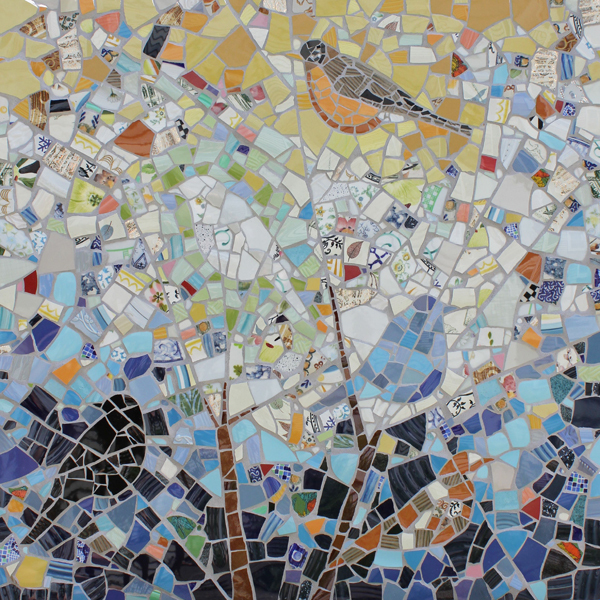 These themes became core elements in the mosaic. 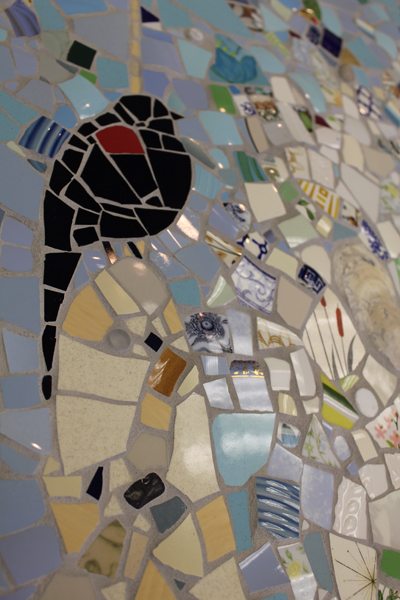 Once we finished the design work I worked intensively on the mosaic for about five months. Chuck provided a place for me to work at the Free State’s eastside brewery, and also hosted an open house there so that friends and brewery patrons could see the mosaic’s development. Thousands-of-tiles-cut-from-ceramic-plates-and-adhered-to-panels later, I am grateful to Chuck for trusting me with the project and for his kindness, generosity, encouragement and help throughout the entire process. A number of people greatly helped, too. 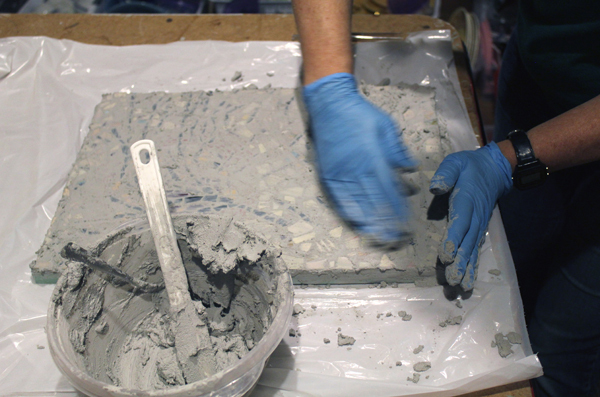 Conrad Snider, a ceramic artist and friend in Newton, Kansas, provided extensive and detailed advice on everything from concrete board, mortar, and grout to how to build sturdy panels that would hold heavy tiles and yet be light enough to move and install. Todd Pederson and Jim Lewis of Independent Woodcraft in Lawrence built panels for the mosaic that would fit exactly right in that stairwell spot. Todd and Jim also installed the finished panels with what struck me as remarkable ease. 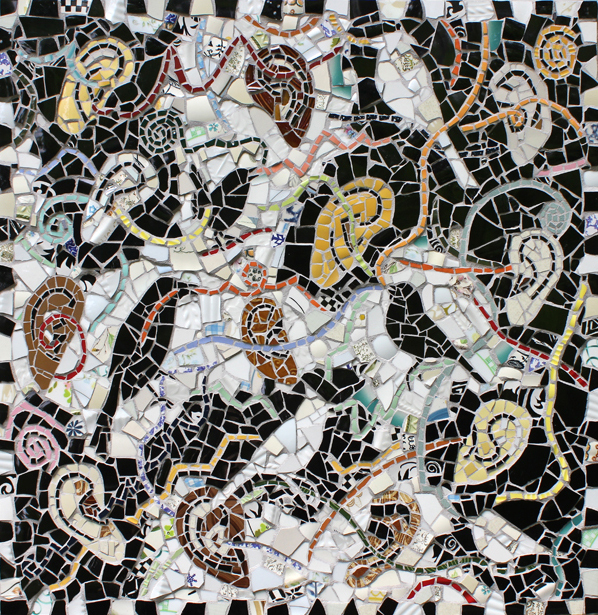 Brit Kring of Kring’s Interiors in Lawrence contributed tiles for the mosaic and in his good-natured way, advice on mortar, grout, and how best to use them in a somewhat unorthodox application. Jana Flory of Krings Interiors also provided information and assistance. When I first moved into my brewery-studio I felt like an interloper in this industrial setting. But the folks who run the brewery and the brewers and bottlers who work there were friendly and welcoming and soon I felt at home. They helped me in ways large and small with things like holding the door open while I hauled stuff in, raising my work tables onto blocks so that I could work standing up, tidying the place for the open house, designing and building a brace for the largest of my panels so that it would travel in the van safely, and on. So thank you Steve Bradt, Brad Scott, Eric McClelland, Lucas Hachmeister, Matt Luna, TJ Campsey, Rick Berger-Munson, Luke Otter, Patrick Raasch, Steve Rold and anyone else from the crew who might have assisted with the mosaic even without me knowing it. 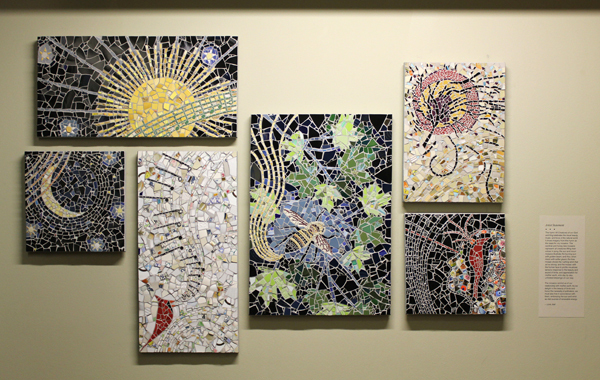 Carolyn Coleman, also of the Free State Brewing Company, made a lovely display about the forthcoming mosaic that was posted in the entryway of the downtown brewery. Thanks to you friends for your conversations with me about the mosaic and for your support (especially Sara Stalling who got the first peek at my design ideas and Lokelani Braisted who sent all kinds of interesting mosaic process information my way), for your social media “likes,” comments, and encouragement, and for attending the mosaic process open house and making it a fun and successful event. 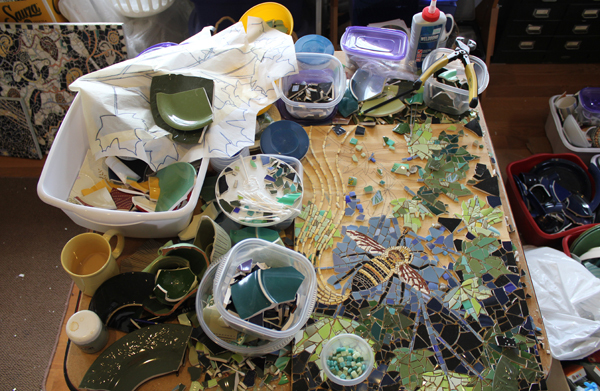 Thanks to Catherine Bolton, Nicholai Jost-Epp, Kathi and Randy Masten, Kristi Neufeld, Kamala Platt, Christy Dersch Schneider and David Schneider for giving me ceramic dishes, pottery, glass, porcelain shards and other special things to incorporate into the mosaic. In addition, Eric McClelland gave me a mussel shell and access to the Brewery’s hardware drawer for me to pick out a few small things to include, and TJ Campsey gave me a bottle with the Free State’s Prairie Falcon beer logo on it — so be sure to look for that little glass piece. Lastly, I would like to thank my family. My parents, father-in-law, and brother never failed to ask me about how things were going on the mosaic and always expressed their excitement about it. And to my husband Chuck and son Nicholai, thanks for all your support and for picking up the slack especially after school, and for keeping me laughing during a few tough times — you two are the best. UPDATE: Please see Dave Loewenstein’s blog about the recent comings and goings of murals in Lawrence, KS, including murals by Stan Herd at the former Tellers Restaurant, KT Walsh at the Poehler Building, and me at the Free State Brewery.